Matilda shoves a toy into my lap because she has learned that sharing is the most fun way to play. Playing with your dog isn’t much fun if all she wants to do is take her toys and play with them by herself. I wasn’t sure how to play with Matilda when she was a puppy. She loved it when I would say “Ready, Set…. GO!” and throw a toy across the room. She even brought the toy back up on the couch with me. But she wouldn’t like it when I tried to take the toy away for another throw. And I didn’t want to make playtime less enjoyable by forcing her to give up her toys. 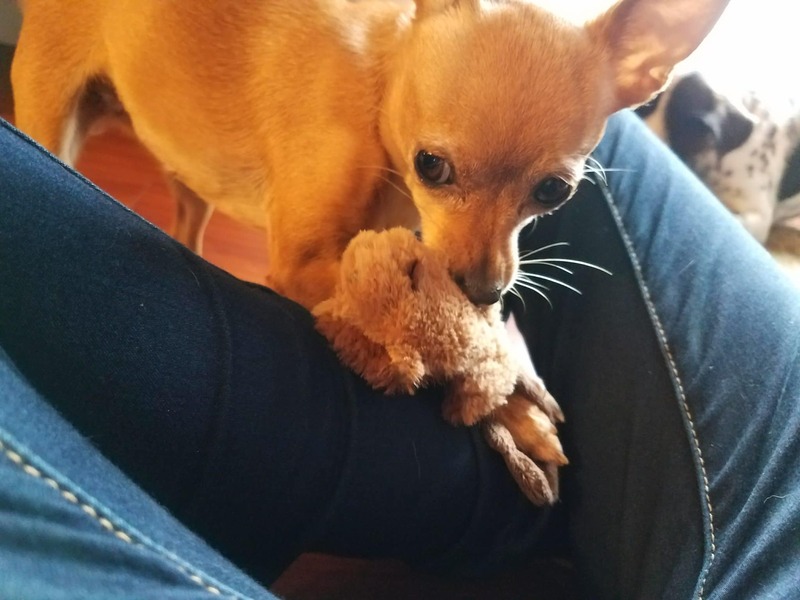 Now, she hops into my lap with her toy, teasing me into playing with her. It’s so much more fun now that I know she actually wants to share her toys with me. Matilda probably didn’t understand the point of bringing toys to me until she learned how to fetch. To teach fetch, I used a lot of food rewards, so at first I didn’t think she’d develop a motivation to bring toys to me if treats were not involved. The key to making fetch more fun, even if you’re not using treats, is to not throw the toy clear across the room every time. Sometimes, I just toss the toy a few feet away. Your dog isn’t going to want to share her toys with you if you always throw them far away. By varying your throwing distance, you’re making yourself less predictable, and making fetch less tiring for your dog. When I was a kid, dog books from the library told me to never let my old dog win when we played tug. If he won, he would believe he was an Alpha. Of course, we now know that this is not true. I’m very careful when I play tug-o-war with Matilda. I never pull the toy so her feet lift off the ground – supporting her body weight with her mouth could break her teeth. I hold the toy and gently tug back, pretending to let the toy slip from my grip every time she jerks until she wins. I like to think she believes that she’s stronger than me. This is probably the best way to get your dog to share. When I let Matilda win at tug, she often hops straight back into my lap for more playtime. Step 3: Draw back if your dog is being possessive. Sometimes, I’ll reach for Matilda’s toy, and she’ll put her mouth over the part I’m about to grab. In that case, I just draw back and ignore her. By disengaging, I’m giving her the freedom to have the toy to herself, but also showing her that if she doesn’t share, I’m not going to play with her. Dogs love it when humans play with them. They’re less likely to interact with their toys unless we’re around to make them move. So, your interaction is a valuable reward for a dog who’s willing to share. It’s not unusual for your dog to growl when you approach them when they’re deeply engrossed in a toy they love. Growling can be part of play, or just a way for your dog to say, “back off, I’m already having fun.” You don’t need to punish your dog for growling when they have a toy, and you shouldn’t force them to give it up. Instead, give them reasons to share, or play with another toy to show them what they’re missing. Possessive aggression can be a serious problem, but a polite growl is nothing to worry about. Avoid snatching toys out of a dog’s mouth. Don’t pull it out of her teeth or put your fingers in her mouth to get her to release. These unpleasant experiences will provoke a dog to bite – they may feel they have no other way to avoid these scary interactions. You can use treats to teach a dog to “release” a toy on command. Adults and supervised, older children should teach dogs to share – not children. Kids can find it difficult to read a dog’s body language, and are at greater risk for bites. When will my dog learn to share her toys? I didn’t see these changes in Matilda overnight. It took months, and lots of patience. I play with her as often as possible, especially when she’s energetic after meals. Lately, she’s been much more playful, ever since she started on a homemade raw diet. The more you play with your dog, the sooner they’ll realize that toys are no fun unless you’re part of the game. Most dogs don’t like to share things and tend to get aggressive. Good tips! It’s not uncommon, even Matilda gets a defensive when she has something she really wants, like a duck foot. But it’s not hard to convince her to trade for something else, or to let me hold her treat so she can chew it more easily. It’s all about trust! Love this! Too funny. My dogs thankfully share their toys but sometimes they are stubborn. Shelby Gottschalk recently posted…Happy 4th of July! Time and Patience are the keys to getting your dog to trust you. My Toby doesn’t like to share his toys with me. But now I know how to teach him. Very helpful article. Thanks, I’m sure Toby will love learning to play with you! My 6 months Pug doesn’t want to play with toys so much. Firstly, I need to find her a toy that she really loves. Teaching her to share toys with me is a further part. Anyways, thanks Lindsay for the great article! Thanks Joy! They seem to enjoy playing with toys more the more you play with them – they tend to not play on their own as much. Informative and useful article for dog owners, Thanks for sharing! This post makes me so happy. At first,I need to find her a toy that she really loves. thanks for your post.